The Utica Ave. subway extension has once again disappeared into the ether of New York City politics. Half a political lifetime ago, Bill de Blasio seemed interested in extending transit to under-served neighborhoods on his own. He didn’t require a giant push from real estate interests looking to boost property values in already-gentrified neighborhoods, and he seemed on the verge of following through on Mayor Bloomberg’s realization that the city could bypass Albany by funding its own subway expansion plans. That moment involved the OneNYC proposal and the Mayor’s call for a study to assess a Utica Ave. subway. Perhaps we — the general transit-lovin’ community of New Yorkers who pay close attention to this kind of stuff — got too excited by it. After all, when I went back tonight to re-read my post from April of 2015, it seems clear that de Blasio wasn’t asking for much. He wanted a study of Utica Ave. and committed the bare minimum of dollars to the project. But as we sit here in 2017, the year in which the MTA was expected to spend the dollars for the study, nothing has happened. As a refresher, the Utica Ave. request was open-ended. The mayor’s proposal called for “a study to explore the expansion of the subway system south along Utica Avenue in Brooklyn, one of the densest areas of the city without direct access to the subway. ” The MTA’s 2015-2019 capital plan took up the call and morphed this request into a study of an “extension of the Eastern Parkway line to provide service on the 3 and 4 lines along Utica Avenue in Brooklyn. The study will be coordinated with the City of New York and may examine extension options, supporting land use changes, and financing strategies.” The MTA allocated the $5 million as a 2017 line item, but nothing has happened. The MTA told the Voice that before work gets going, it is talking with the city to get a better idea of what the de Blasio administration is looking to get out of the study, before hiring a consultant to prepare the report next year. “DOT is actively working with the MTA and the Department of City Planning on a study of the extension of the Utica Avenue subway line,” a transportation department spokesperson said. The city might claim it’s “actively working,” but elected officials along the route have yet to hear anything. “It’s really been quiet,” said Assembly Member N. Nick Perry. “Our office hasn’t been included in any of the planning meetings for the Utica Avenue subway, if there have been any,” said a spokesperson for State Senator Kevin S. Parker. “As of yet, there has not been outreach by the MTA or DOT to my office regarding the Utica Avenue subway extension study,” State Senator Jesse Hamilton said in a statement. But elected officials and residents have heard little about the planned study — which was scheduled to be conducted in the current fiscal year ending June 30 — and are beginning to voice their complaints about a lack of communication from the state-run Metropolitan Transportation Authority and the New York City Department of Transportation. “I definitely wasn’t consulted, I do know about the study, but I wasn’t told about it.” said Council Member Jumaane Williams, who represents the East Flatbush district where the line would be built. Williams said he had to contact the DOT directly after he learned about the study in 2015, and ask for an update himself. “My hope is that maybe with this new study, they’re trying to get us more involved…but the reality is I don’t think many of us are aware,” he said. An MTA spokesperson told Berger that the agency, along with NYC DOT “launched the study process last year.” It’s not entirely clear what that means as no one really wants to talk about it and politicians have not been involved in the process. We’ll see if anything comes of it. But just because nothing is happening doesn’t mean there isn’t a lesson here. Setting aside the question as to whether a Utica Ave. subway extension is a better use of dollars than, say, the BQX (spoiler alert: it is), this type of transit planning limbo is what happens when dollars and a champion don’t materialize. Bill de Blasio never really cared about the Utica Ave. subway. Likely, some staffer inserted a paragraph into the OneNYC report and billed as a way to draw attention to increased mobility in a middle income area without particularly robust transit options. The mayor didn’t object, but he allocated the bare minimum of dollars for the project. It seems you can’t even buy a study for $5 million, let alone plans for a subway line. For a project of this nature — or really any transit project in 2017 — to become a reality, it needs a champion. It needs someone who will make the case for the project start to finish, and more important, it needs someone who deliver all of the dollars for the project and not just a token amount of pocket change to burnish those bona fides. Even more than the BQX, the Utica Ave. subway was a nice bit of vaporware. At some point, there may be a study, but don’t hold your breath for a subway. No one in power seems to care enough. It's a bit dark but the ghosts of Bergen St are visible this weekend as Manhattan-bound F trains run express. Every now and then, due, at times, to the never-ending rehabilitation of the Culver Viaduct or other track work in the vicinity, the F train in Brooklyn runs express between Jay St.-MetroTech and some station farther south. The transit cognoscenti know to look out for glimpses of a ghost station once that F train nears or leaves Jay St., and over the weekend, as the F went express, an eagle-eyed observer could catch the the abandoned lower level at Bergen St.
As ghost stations go, the Bergen St. lower level is hardly a secret. Multiple doors that are often kept unlocked dot the upper level at Bergen St., and the 1999 fire at that station earned headlines. For those in Brooklyn fighting for the restoration of the F express service, the Bergen St. station may or may not be the lynchpin. Trains can bypass the Bergen St. station, but as you can barely see from the video I shot over the weekend, there’s not much there. The station is an abandoned mess of darkness, and the MTA has used parts of it for storage. Yet, it’s future is as intriguing as its mere existence, a shadow of subway past. The idea behind the F express service is one I have explored at length in the past, and it’s one that has garnered recent attention. The MTA apparently has a report on the idea sitting in a proverbial drawer, and this report has possibly been sitting in this drawer for three years. Yet, no one has seen the report, and politicians have again been agitating for F express service. The idea is an obvious one: The MTA could use dormant and pre-existing infrastructure — in this case, express tracks along the Culver Line to improve service to those more remote areas of Brooklyn. For some commuters, rides could be shortened by 5-10 minutes. But there is a rub; there is always a rub. As currently configured, F express service would lead to reduced service for some of the F’s busiest Brooklyn stations. Carroll St., Smith-9th Sts., 4th-9th Sts., and 15th St.-Prospect Park, to name a few, would see less frequent F train service, and the ridership from those stations far outpaces the number of riders who would gain a few minutes from the express service. If the MTA can’t rehabilitate the lower level at Bergen St. to permit passenger service — an undertaking that would be quite expensive, according to 2012 comments from one Transit official, another 11,000 riders would see F service slashed. Simply put, based on current load guidelines, the MTA cannot add F express service while maintaining local service frequencies that handle customer demand. So why not, you may ask, just run more F local trains? It seems like a simple solution, but it’s not quite that easy. Most importantly, the MTA would need additional Manhattan and East River capacity to run more F trains, and based on various F service patterns — interlining with the G in Brooklyn, the M in Manhattan and the E in Queens — the route cannot support additional trains. Second, the MTA doesn’t have the rolling stock to add F express trains. That’s a more solvable, albeit an expensive one, for a solution that seems to create more problems than it solves. Of course, with an additional East River crossing — perhaps a Phase 5 of the Second Ave. Subway were we all to live that long — the problem would be resolved, but now we’re talking in decades rather than years. Word is that the MTA’s own studies on the F express plan show little to no net travel gains from the F express plan, but the idea is a political hot potato that the agency isn’t comfortable quashing quite yet. So the idea percolates every few months or years as that idea that will save Midwood from its schleppy F train service. I can’t blame anyone from hoping, but that lower level at Bergen St. seems more like a taunt that a promise of future service. Every now and then, we get a glimpse of a different plan, but it remains out of reach, perhaps for good reason. Jonathan English at Urban Omnibus has proposed an extension of the 3 train that seems perfectly reasonable. When we talk about subway and transit expansion, it’s easy to get blinded by large and ambitious plans to transform the city. We talk about the Triboro RX line, reactivation of the Rockaway Beach Branch ROW or countless other pie-in-the-sky routes (including that Brooklyn-Queens Connector the mayor is pushing), but sometimes, we should take a step back and look at something easier. Not everything has to involve multiple stops spread out over many miles or a new-to-New York mode of transit. In a way, that’s what New York state may be trying to do with the Penn Station Access proposal. For the relatively affordable price of $1 billion, Gov. Andrew Cuomo thinks Metro-North can construct four new stations in the Bronx along a preexisting right of way and provide commuter rail service into Manhattan’s Penn Station on the West Side. It’s not the sexiest of projects, but it provides a vital connection to Penn Station. It’s also an important reminder that low-hanging fruit can pay off. Building such an extension is far less expensive than building a new subway line from scratch. Since the tracks already exist — and the yard makes land available for a surface station — there is no need for multi-billion-dollar underground construction…The only other cost would be replacing the converted train storage tracks. (Only a small part of the yard would need to be converted, and the existing maintenance facility could remain.) Trains could be stored at other yards in the “A division” of the subway (the narrow-car ex-IRT), where the MTA has indicated that slack is available. Much of the work could be joined with the $91.4 million renovation at the Livonia Yard that is included in the MTA’s 2015-2019 Capital Program. Spring Creek, which would be served by the new extension, is both fast-growing — no Brooklyn neighborhood has added more residents since 1940 — and transit-deprived. It has been the site of major new affordable housing construction in recent years, including the Bloomberg-era 2,200-unit Spring Creek Nehemiah project. The nearby Spring Creek Towers, which opened in 1974 as Starrett City, comprise 5,881 Mitchell-Lama units. Right now, Spring Creek has some of the longest average commutes in the city, at 48.9 minutes. The extension would follow part of the route of the B6, which has over 40,000 riders on an average weekday and is one of the busiest bus routes in the city. And it would shorten or replace the route of the B84 shuttle, which takes riders from the Gateway Center to New Lots Avenue station. English compares the cost of the work favorable to the in-fill Yankee Stadium Metro-North stop which the MTA was able to open for around $91 million as opposed to the one-stop $2.4 billion extension of the 7 line. For minimal amounts of money — a rounding error in the MTA’s capital plan — the 3 train could expand its reach through a neighborhood soon to be upzoned as part of the Mayor’s affordable housing project. That such an easy transit project isn’t on anyone’s agenda is problematic at best and a fatal flaw at worst. These types of low-hanging fruit aren’t readily available in too many places throughout the city. Most expansion efforts — even modest one-stop plans above ground — require construction of new tracks, new tunnels, new stations and the land acquisition costs that go along with it. Here, in East New York though, the opportunity exists for a low-cost subway extension along an existing active ROW. Why not indeed? The MTA’s looming L train shutdown is the bad P.R. problem that won’t go away. It doesn’t really have to be like that, as I wrote in January, but the MTA and neighborhood activists along the L train are engaged in a giant game of transit chicken. So far, it seems, the MTA is losing, and as the agency stalls and stonewalls on calls to release more details regarding the state of the Canarise Tubes, it will only get worse for an agency facing the reality of a shutdown for one of its most popular routes. As we learned back in early 2015, the extent of the L train work is massive. The MTA has to reconstruct all of the systems inside the Canarise Tube and replace the track bad following a flood that saw 7 million gallons flood the tunnel from Ave. D to the North 7th St. fan plant. 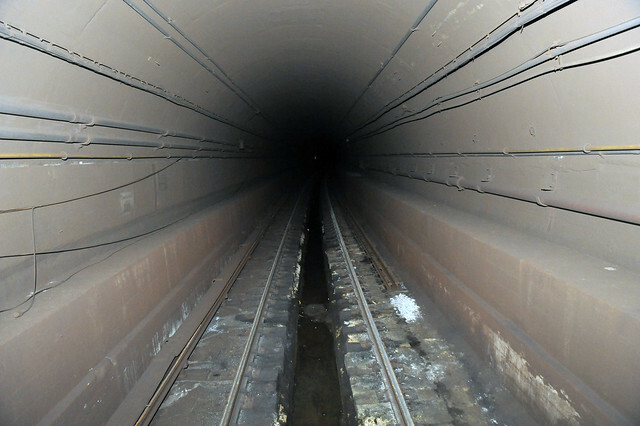 The tunnel itself isn’t at risk of collapse, and the agency was able to make temporary repairs to enable train service to run between Brooklyn and Manhattan for some indeterminate length of time. But sooner or later, the tunnel will need repairs. What the community would really like to know is what plans the MTA is seriously considering to make the Canarsie Tube repairs, and whether those plans will suspend L service between the boroughs for several years. The MTA has said that it is not ready to make that announcement. It has committed to holding public hearings with community stakeholders on the matter, but no dates for those hearings have yet been set. CB 1 wants the ability to conduct its own studies or at least evaluate the MTA’s assessments, but those assessments haven’t been forthcoming. Meanwhile, considering the extent of Sandy damage, I have no reason to doubt the MTA’s view of the L train, but the MTA still has to make the case to its constituents that any prolonged shutdown is necessary and unavoidable. The agency hasn’t done that yet, and as L train riders worry that the tunnel will, at of the blue, become unusable, riders are in the dark as to the extent and impact of the damage. The complaints from CB 1 extend beyond what we’ve seen from the so-called L Train Coalition to date. This isn’t about kicking out an unresponsive MTA rep or proposing building a new tunnel first; this is about open communications between an agency that holds the fate of a few hundred thousand daily commuters in its hands. Right now, they’re failing the neighborhood, and as long as the MTA goes without divulging more details, the less credibility they have. For the past few years, as subway ridership has exploded, entrances that were closed during the bad old days have come under scrutiny. Neighborhood groups have called upon the MTA to reopen these entrances — many of which are along the suddenly popular G, J/M/Z and L lines — and I’ve looked at these entrances numerous times over the past few years (take a look at my posts from November and January of 2015 for recent coverage). Now, one tireless advocate wants to use the L train shutdown as the impetus to open these new entrances, and his is a plan the L Train Coalition and MTA should adopt. Alan Minor, a board member with Neighbors Allied for Good Growth, a community group focusing on Williamsburg and Greenpoint, has long pushed the MTA reopen entrances. The closed access points, often long blocks away from main entrances, would shorten commutes and better distribute riders along crowded platforms. But for various reasons, the MTA has resisted these calls. Now Minor feels the looming L train shutdown would give the agency the perfect excuse to reopen these entrances. While advocates have been working with local politicians to push the MTA to reopen the defunct staircases and entrances for years citing surging ridership, news that L train service will be disrupted between Manhattan and Brooklyn for between 18 months and three years has given them a renewed sense of urgency, they said. …Take the Metropolitan and Lorimer G and L stop, a transfer station that could see a huge bump in riders switching to the G train if the L doesn’t run into Manhattan. That Williamsburg station has six closed staircases and one closed entrance, according to the MTA. On either side of Union Avenue where Hope and Powers streets intersect it, there are two yellow grates emblazoned with the words “Subway Keep Clear.” On the corner of Grand Street and Union Avenue, there’s another metallic grate with the same words, and across Union from that, Minor suspects, is one staircase that’s been sealed with concrete. In response to the article, the MTA reiterated its noncommittal position on closed entrances. “As part of our efforts to accommodate growing ridership, we are studying and evaluating closed access points throughout the subway system and we’re looking at every idea for how to provide alternate service to L customers during any potential shutdown,” the agency said in a statement to DNA Info. As I understand there are two major barriers to reopening these entrances. First, as I’ve explored in the past, the MTA is worried that ADA requirements trigger full accessibility if these entrances are opened, and the agency cannot afford full accessibility build-outs for these stations. Whether any group with standing is capitalized enough right now to take the MTA to court over ADA violations remains an open question, but with the government breathing down the MTA’s neck, the agency may be hesitant to so blatantly flaunt ADA requirements. Second, from what I’ve been told, the MTA may not have enough equipment on hand to reopen entrances that have been closed for a long time. Due to the opening of the 7 line extension and the impending-ish debut of the Second Ave. Subway, all MetroCard turnstiles are spoken for, and the agency doesn’t have a bunch of HEETs in a closet somewhere. Consider the institutional desire to move beyond the MetroCard and not spend much money on an obsolete technology, the MTA doesn’t want to open entrances closed before the advent of the MetroCard without fare payment equipment on hand, and they don’t want to pony up big bucks for turnstile technology with a five-year expected life span. So these entrances remain in limbo. While the L train coalition has busied itself with pie-in-the-sky proposals for a new East River subway tunnel, this is the kind of improvement the group should be focusing on. If the MTA can help disperse some customers, making up for the lost capacity of the L train tunnel gets incrementally easier. It’s a baby step but a step nonetheless, and it will take many steps to overcome the dreaded L train shutdown. Mayor Bill de Blasio, in his State of the City speech, is set to announce support for a $2.5 billion plan to build a light rail that would connect the rapidly developing Brooklyn and Queens waterfront areas. The proposal, developed over the past six months by a group of real estate developers, transportation advocates and urban planners calling itself the Friends of the Brooklyn Queens Connector, aims to provide better transit options for job centers in Industry City, Red Hook and the Brooklyn Navy Yards while easing the north-south connections between Astoria, Long Island City and parts south throughout Brooklyn. It is not a slam-dunk proposal from a transit perspective, and the city will have to make the case that it is a sound investment considering the city’s competing needs. The plan, to be unveiled on Thursday in the mayor’s State of the City speech, calls for a line that runs aboveground on rails embedded in public roadways and flows alongside automobile traffic — a sleeker and nimbler version of San Francisco’s trolleys…The streetcar system, which would realize a long-held fantasy of the city’s urban planners, is expected to cost about $2.5 billion, significantly less than a new underground subway line, city officials said on Wednesday. The routing is as reported a few weeks back. The system would terminate in Sunset Park near Industry City, travel through Red Hook and then along the waterfront through Brooklyn Heights and DUMBO to the Navy Yards before passing the Two Trees’ Domino development in Williamsburg and journeying through Greenpoint en route to Long Island City and the western edge of Astoria. While early reports aren’t definite on this number, I’ve been told that, despite renderings, the city would like more than 70 percent of the streetcar route to run on a dedicated right of way. Any mixed-traffic plan should be discarded immediately, but those details have yet to be fully made public. Others though are less convinced, and in an explosion of analysis early on Wednesday, various folks who contribute to what has been termed Transit Twitter expressed a healthy degree of skepticism directed toward this project. It isn’t, they contended, on a route that isn’t already served by somewhat nearby subway lines or, in some places, very nearby subway lines, including the G train, and buses that run through the areas don’t have ridership that would lend itself to a successful fixed rail system. Plus, for $2.5 billion, the city could effectively ensure enough money for the MTA to bond out the dollars required to build more phases of the Second Ave. Subway and the Utica Ave. subway, two projects that would be more impactful that a new light rail system not prohibitively far from an existing subway route. A map of the proposed streetcar route. Click the image to enlarge. There is the question too of the drivers behind this route. Considering the city’s other needs and potential funding opportunities, why a streetcar and why here? Two Trees seems to be a major player in this effort and in waterfront development up and down this Brooklyn Queens Connector corridor, and they stand to benefit the most from more waterfront access. Plus, as The Times notes, this light rail project wouldn’t require state approval or oversight. Thus, de Blasio can push through a major infrastructure project without running into interference from Andrew Cuomo, his gubernatorial nemesis up the road. Despite the initial objections and the ins and outs of the politics behind this plan, as I said a few weeks ago, I don’t hate this idea so long as it’s implemented properly. The city has been pushing to bring jobs to both Industry City and the Navy Yards, and while few people would take the 27 minute north-to-side ride from Sunset Park to Astoria, a lot of people would ride from one end to the middle or from the middle to an end. (Anyway, who rides the A regularly from Inwood to the Rockaways? That’s not quite the point of a lengthy transit route.) Plus, with a northern terminus planned for Astoria, it’s not a stretch to see a future connection to Laguardia Airport via the BMT’s Ditmars Boulevard terminal. That’s a far more appealing option than Gov. Andrew Cuomo’s misguided Willets Point AirTrain. To be a success, this light rail line must run in its own dedicated lane and, for better or worse, be integrated into the MTA’s fare structure. The city should consider upzoning where possible along its route, but already, many including former NYC DOT planning director Jon Orcutt, don’t believe the funding scheme is realistic. That’s part of the case the mayor will have to make. Ultimately, it’s a big idea and it’s a new idea with shiny technology that we don’t have here in New York City. That angle is going to drive part of the dialogue around this plan, but in reality, we need to see a rigorous defense that justifies $2.4 billion in light of competing needs. Building because some developers are willing to foot the bill simply supports the idea that there are two New Yorks — one where access to money and power gets things done and another stuck depending change but unable to realize it. Transportation investments that will reverberate through the decades deserve a bit more consideration than that. Whatsamatta with the R train? Over the past few years, local subway riders on the BMT 4th Avenue line have had a rough go of it. After over 20 years of ample peak-hour service — both the M (or N) and R trains served 4th Ave. from the mid-1980s until 2010 — R train riders have suffered through reductions in service, 13 months of transfers due to Sandy work and, now, constant complaints about reliability. Since the Montague Tubes reopened following Fix & Fortify work, riders have loudly voiced their views that R service isn’t satisfactory and has gotten worse. Pols are picking up the cause, but the MTA says it won’t do anything until the Second Ave. Subway opens. The exact nature of the complaints from riders are standard throughout the system, but from constant stories, it sounds as though the R train in Brooklyn has been particularly unreliable lately. A letter from City Council member Vincent Gentile to the MTA noted “many late and overcrowded trains, infrequent service, frequent delays, unkempt stations, inadequate audio systems, and the use of older subway cars.” Some of these complaints are valid and systematic; the MTA hasn’t overhauled some pretty sorry stations along 4th Ave. in decades. Some stretch the bounds of pity. The R train’s rolling stock, for instance, is perfectly adequately and won’t be due up for replacement until the latter part of the 2020s. And some — infrequent service, for one — are a direct result of the loss of the M train. The R, in other words, is the perfect storm of problems for the MTA. It runs through rapidly expanding (and gentrifying) neighborhoods and offers Bay Ridge its lone, slow subway connection to Manhattan. The pure data is hard to pinpoint, but experiences and anecdotes suggest the service along this line has not been up to snuff lately. As the R stretches from Forest Hills to Bay Ridge and shares tracks at various points with the N, Q, and M lines, the challenges are extreme. First, if nothing else, conduct an audit to find out just how bad the service is and exactly what is needed to alleviate the trouble. Second, add more and newer trains to the R route to increase frequency and decrease late arrivals of the R. Third, put the R train on its own line in Manhattan so that delays caused by waiting for other trains that run on the same line, such as the N, cease to happen. Fourth, speed up the installation of platform countdown clocks and add other amenities on the subway cars such as digital stop trackers. Finally, if you do not replace the train cars entirely, at the very least add new audio systems that riders can actually hear and decipher in the event of an emergency or delay. Currently, a majority of the audio systems on the R train fleet are inaudible and/or incomprehensible. In addition, I am proposing several changes to the scheduling for the R line that I also request be made as soon as possible. First, discontinue the late night R shuttle that forces riders heading into Bay Ridge at night to get off the train at 36th Street in Sunset Park and wait upwards of an additional 20-30 minutes for an R shuttle to arrive and complete their trip home. Second, since the TA itself claims many delays on the R line result from the length of the entire line itself, I am advocating the creation of an R line rush hour special from 95th Street in Bay Ridge to Chambers Street and back. This special segmented line will address and alleviate some of the delays experienced by Bay Ridgeites who work in lower Manhattan. This is a jumble of ideas, again some better than others, but it seems indicative of the need for additional peak-hour service along 4th Ave. In addition to the letter, Gentile, along with Daniel Squadron, the Straphangers Campaign, and the Riders Alliance, has urged the MTA to conduct a full line review — essentially an audit — of R train operations to determine how best to improve the line. These line reviews can be modest and may fall victim to politics, but auditing service along particular lines is something the MTA has said it will do regularly. Yet, the MTA is a bit resistant to the idea that the R is problematic. Internal load guidelines — also established by the MTA and loosened in 2010 — have determined the R to be at 62 percent of capacity during a.m. peak hours and between 30-60 percent of capacity during non-peak hours. This has always raised questions regarding induced demand and chicken-and-egg problems. Can the MTA improve service and boost ridership by increasing service and improving reliability? Chairman Prendergast has committed to undertake full line reviews of all subway lines in the system. Since 2009, NYCT has completed reviews of the F, L, G and recently the A and C lines. Since all of the reviews conducted thus far have focused on the subway’s lettered lines (like the R), NYCT plans to select one or more lines on the numbered lines as the next line(s) to review. A review of the R has not yet been scheduled because if we were to conduct a line review of the R now, it would be obsolete almost immediately, because the opening of the Second Avenue Subway will significantly change overall service on the Broadway Line. The opening of Second Avenue Subway will affect how many people ride the R and how the R operates, so it would be premature for us to conduct an R line review on the cusp of such a change. So the R could be doing better, but it’s not at capacity. Meanwhile, we’re on the cusp of major changes to the BMT once the Second Ave. Subway opens (whenever that might be), and for now, R train riders are stuck with what they have, an M-less ride down 4th Ave. Is that a satisfactory response? It’s hard to say.